Catherine Laboure, a novitiate in the order of the Sisters of Charity, received various visions of St. Vincent and of Jesus present in the Eucharist before experiencing two apparitions of the Blessed Virgin Mary. In the first vision, July 18th, 1830, Catherine is told of the impending travails of France and of an unspecified future mission. Several months later she received a message detailing the designs for a medal, later known as the Miraculous Medal, now reproduced over a billion times and distributed around the world. The apparition was investigated in 1836 and later approved. Catherine worked for 46 more years in hospices of her Order until her death in 1876. Her body lies incorrupt at the site of the apparition to this day. She was canonized by the Church in 1947. Click here to view images from Rue du Bac. Catherine Laboure is born the ninth of eleven children at Fain-les-Moûtiers (near Dijon), Côte d'Or, France. She was baptized Zoë Labouré, daughter of a yeoman farmer. Catherine’s birthday, May 2, falls on the feast day of Sts. Exsuperius and Zoe, so from a young age everyone called her Zoe. Her elder sister, Louisa, joins the Sisters of Charity. After Catherine received her First Holy Communion at the age of 12, she had a deep desire to pursue a vocation in religious life. One day, young Catherine was in the village church of Fain-Les-Moutiers when she experienced one of her first mystical experience. In her vision, she saw an elderly priest celebrating Mass. The old priest beckoned her, but she drew backwards, never taking her eyes off him. Suddenly Catherine found herself in what looked to be an infirmary. The same priest was there. He looked at her and said, “My child, it is a good idea to care for the sick. You run away from me now, but one day you will gladly come to me. God has designs for you. Do not forget that.” She prayed to understand the meaning behind her vision. When Catherine was 22, she asked her father’s permission to follow in her sister’s footsteps. Her father, however, refused and sent her to work in her brother’s coffee shop in Paris. Although she was a country girl who had never learned to read or write, Catherine never wavered in her faith and remained determined to enter the religious life. Shortly after, Catherine’s father changed his mind and granted her permission to follow her dream. She entered religious life on January 22, 1830 at the Hospice de la Charite in Chatillon-sur-Seine. Her postulancy lasted three months, after which she was admitted to the Sisters of Charity at Châtillon-sur-Seinesent to live at the mother house of the Daughters of Charity of Saint Vincent de Paul at 140 Rue du Bacin Paris. Sent to the Novitiate; After her postulancy, she went to a convent in the rue du Bac, Paris. She arrived several days before the translation of relics of Saint Vincent from Notre Dame to the Lazarist Church in rue de Sèvres. The Daughters of Charity took part in processions and prayers in honor of their founder. For three nights in a row, Catherine experienced visions of what she believed to be St. Vincent de Paul’s heart. When she told the convent chaplain about her vision, however, he instructed her to forget what she had seen and not speak about it. On the eve of St. Vincent de Paul’s feast day, Catherine prayed that St. Vincent might intercede for her in asking God to grant her a special favor. She was awakened about 11:30 p.m. on July 18 by a "shining child," who she thought to be her guardian angel who led her to the chapel, where she was surprised to find all the candles lit as if it was Midnight Mass. But the chapel was empty. Our Lady appeared and talked with her for hours, telling her that she would have to undertake a difficult task. Mary told Catherine that God had a special job for her to do, and also warned of a great time of upheaval that would occur in France and beyond. Later, Catherine asked Our Lady the meaning of what had been shown to her. When Catherine reported the first apparition to her confessor, Fr. Jean Marie Aladel, he told her that it must have been a dream and that she should try to forget about it. She was surrounded by the words Ô Marie, conçue sans péché, priez pour nous qui avons recours à vous ( "O Mary, conceived without sin, pray for us who have recourse to thee!") The picture turned around, and on the reverse side appeared a capital M with a cross above it and two hearts, one thorn-crowned and one pierced with a sword, beneath. Catherine heard a voice asking her to have a medal struck, promising that all who wore the medal would receive great graces.Thus the design for Miraculous Medal revealed. "This globe which you see is the world, France in particular and for every person living in it. I am praying for it and for everyone in the world. The rays which shed on the globe from my hands are the graces which I bestow for all those who ask for them. But there are no rays that come from some of the gems (from my fingers) because those are the graces which God wishes to bestow on them but they forget to ask..."
Catherine confided in her confessor, Father Aladel, and he, convinced of her sincerity, persuaded Archbishop de Quélen of Paris to give permission for a medal to be struck. Catherine received the habit of the Daughters of Charity and went to work at a hospice in a Paris suburb. She continued to ask Fr. Aladel, and after observing Catherine’s normal daily behavior for nearly two years, he finally informed the Archbishop of Paris about Our Lady’s request. After her year of extraordinary grace, Catherine was sent to the convent Enghien-Reuilly on the outskirts of Paris. There Catherine served as portress until her death, engaging in menial tasks such as looking after the poultry and overseeing the aged living in the Hospice d'Enghien. The first 1,500 of the millions of medals to be made-now known to Catholics as the 'Miraculous Medal'-were struck. The archbishop initiated an official canonical inquiry into the alleged visions. Catherine refused to appear, wishing her identity to be kept a secret. Fr. Aladel pleaded to be allowed to keep her name anonymous. The tribunal, basing its opinion on the stability of her confessor and Catherine's character, decided to favor the authenticity of the visions. "the story is rooted in a spiritual vision . It is an illustration of what would have seen a Sister of Charity of Saint Vincent de Paul in the community chapel (the name of Catherine Labouré is not mentioned) [...] It is suggested that the vision could not be purely imaginary having appeared several times [...]. She was not the effect of a dream, or the product of an excited imagination, which took place during the day, during prayer or Mass [...] The effects of the medal [.. .] seem to be the means by which the sky seems to have confirmed the reality of the vision, the truth of the words of the visionary and have approved the draft and the spread of the medal"
Approved as authentic by Archbishop Hyacinthe-Louis de Quélen of Paris. For more than forty years, Catherine worked at a hospice, caring for dying patients. 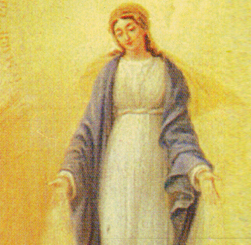 Although Catherine only experienced only those few apparitions of Our Lady where she actually saw her, she began experiencing locutions – like an apparition but only as an interior voice – just as Our Lady promised. The popularity of the medal grew, especially after the conversion of Alphonse Ratisbonne in 1842. Alphonse was an Alsatian Jew who, having been persuaded to wear the medal received a vision of Our Lady in the church of Sant'Andrea delle Frate at Rome, became a priest, and founded the religious congregation known as the Fathers and Sisters of Zion. When Father Aladel, Catherine was left with no one who knew her story and what she had experienced. Sensing that the end of her life was drawing near, Catherine asked Our Lady for permission to share her story, which Our Lady granted. Catherine reveaed her identity as the visionary and encouraged construction of “Virgin of the Globe” statue. She confided in her superior, Sister Dufé. Catherine dies. Her incorrupt body remains in the convent chapel at the rue du Bac, where miracles were reported at her tomb. Catherine was declated venerable by Pope Pius XI (decree of heroic virtues). Catherine is beatified by Pope Pius XI. Catherine is canonized by Pope Pius XII. "The Virgin was standing. She was of medium height, and clothed in all white. Her dress was of the whiteness of dawn, made in the style called a la Vierge, that is, high neck and plain sleeves. A white veil covered her head and and fell on either side of her feet. Under the veil her hair, in coils, was bound with a fillet ornamented with lace, about three centimeters in height or of two fingers' breadth, without pleats, and resting lightly on the hair. Her face was sufficiently exposed, indeed exposed very well, and so beautiful that it seems to me impossible to express her ravishing beauty." The Virgin appeared twice – July 18 and November 30, 1870. "The Cross will be treated with contempt, they will hurl it to the ground and trample it. Blood will flow. The streets will run with blood." Riots broke out all over Paris and Churches were desecrated. The Archbishop Msgr. Darboy (1871) and two subsequent of Paris were murdered during this period. The Archbishop was beaten and stripped of his clothes. Some of the buildings housing religious communities were burned down; although threatened by angry crowds, the building housing the Sisters of Charity at the Rue du Bac went unharmed. Her incorrupt body remains in the convent chapel at the rue du Bac, where miracles were reported at her tomb. In 1836, the Archbishop Hyacinthe-Louis de Quélen of Paris initiated an official canonical inquiry into the alleged visions. Catherine refused to appear, wishing her identity to be kept a secret. Fr. Aladel pleaded to be allowed to keep her name anonymous. The tribunal, basing its opinion on the stability of her confessor and Catherine's character, decided to favor the authenticity of the visions. "the story is rooted in a spiritual vision . It is an illustration of what would have seen a Sister of Charity of Saint Vincent de Paul in the community chapel (the name of Catherine Labouré is not mentioned) [...] It is suggested that the vision could not be purely imaginary having appeared several times [...]. She was not the effect of a dream, or the product of an excited imagination, which took place during the day, during prayer or Mass [...] The effects of the medal [.. .] seem to be the means by which the sky seems to have confirmed the reality of the vision, the truth of the words of the visionary and have approved the draft and the spread of the medal" Approved as authentic by Archbishop Hyacinthe-Louis de Quélen of Paris on July 13, 1836. The Feast Day of St. Catherine Laboure is November 28 (it was formerly celebrated on December 31). Source: Aladel, M. (1999). The Miraculous Medal. Albany, New York: Preserving Christian Publications, Inc.. pp. 49-51.
with the fullness of God's redeeming grace. to allow God to be God in your life. you show us where to find redeeming grace. and say "yes" to all He asks of us. Dear Christ, You Who so fully completed Your mission, Who did so with such strength, and Who guided St. Catherine to do the same, send the Virgin Mary into our lives to guide as to our own missions. Send the Blessed Mother so that we may make use of every minute that we are on this earth. Send Your mother so that upon death we may be pleasing to You, dear Lord, and have the joy of knowing we accomplished what was assigned to us at birth. Pray for us, St. Catherine, that we may have our eyes opened to the missions given us by our Creator, and that we may approach life in imitation of your quietness, servitude, and longsuffering. Please, Catherine, help us with a deeper devotion to the Virgin Mary and specifically to the Miraculous Medal. Ask that God grant yet greater graces in our lives as a result of this devotion, and let us too `see' the resplendent lights, the radiant grace, that Jesus gives through the hands of His most holy and Blessed Mother. Oh Mary, conceived without sin, wash away our sins and pray for our humility, for our purity, and for the fulfillment of our life work for God the Father! Let us accept what is sent our way and realize God's hidden designs in all challenges and sufferings! O Virgin Mother of God, Mary Immaculate, we dedicate and consecrate ourselves to thee under the title of Our Lady of the Miraculous Medal. May this medal be for each one of us a sure sign of thy affection for us and a constant reminder of our duties towards thee. Ever while wearing it, may we be blessed by thy loving protection and preserved in the grace of thy Son. O most powerful Virgin, Mother of Our Savior, keep us close to thee every moment of our lives. Obtain for us, thy children, the grace of a happy death; so that, in union with thee, we may enjoy the bliss of heaven forever. Amen. Chieriotti, Luigi. Les apparitions de la Medaille Miraculeuse. Montsura (France): Editions Resaic, 1988. Englebert, Omer. Catherine Laboure and the modern apparitions of Our Lady. New York: Kennedy, 1959. McMenamin, M. 2010. Precisely dated early versions of the Miraculous Medal. Numismatics International Bulletin, v. 45, nos. 3/4, p. 43-48. Mack, John (2003). The museum of the mind: art and memory in world cultures. British Museum. Glass, Joseph, "Miraculous Medal". Catholic Encyclopedia. New York: Robert Appleton Company. 1913. Accessed 2011-05-20.